Let’s be honest: it can get depressing to constantly hear the media focus on sports scandals. There is a seemingly endless parade of athletes taking steroids, running dog fighting operations, or being arrested in bar room brawls. Get ready for some inspirational sports stories for once! The Wednesday October 24 edition of Catholic Focus, airing at 7pm and 11pm ET with an encore presentation Saturday October 27th at the same times, features an inside look at the new hit film Champions of Faith. 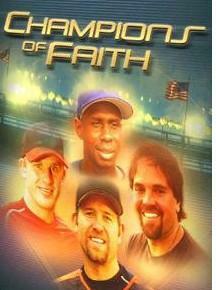 This award winning documentary profiles Major League Baseball Stars who are passionate about the game of baseball and their Catholic faith. Stars like Mike Piazza, David Eckstein, Jeff Suppan, Mike Sweeney, and Jack McKeon lead an all star lineup in this moving and uplifting film. In this episode of Focus I interview Tom Allen, the Executive Producer and Director of Champions of Faith. Several clips from the film are also featured, including the powerful testimonies of Jack McKeon, the long-time manager with a special devotion to St. Thérèse of Lisieux, and Kansas City Royals five time All-Star first baseman Mike Sweeney who shares his story of faith and forgiveness. So tune in to Catholic Focus this Wednesday evening, and check out the Champions of Faith website for more information about this great Catholic film!